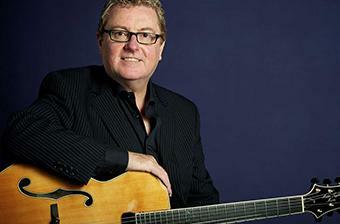 Martin Taylor is a Grammy® nominated fingerstyle guitarist, solo jazz guitar virtuoso and online guitar teacher. Martin has collaborated with the biggest names in guitar music including Tommy Emmanuel, Jeff Beck, Chet Atkins, Frank Vignola, Barney Kessell, Earl Klugh, Herb Ellis, Scotty Moore, Julian Lage, Andreas Oberg, Albert Lee, and Laurence Juber. Martin has been awarded two honorary doctorates, a BBC lifetime achievement award, an IAJE Jazz Educators award, and in 2002 he was appointed MBE 'For Services to Jazz Music' by the Queen of Great Britain. He has been teaching fingerstyle guitar online with ArtistWorks since 2010. Adding a Melody to "Satin Doll"
Applying All You've Learned to "Satin Doll"
Play a Simple Version of "Satin Doll"
Additional Concepts Found in "Satin Doll"
Play Another Version of "Satin Doll"
Improvisation Part 6: Example "My Romance"
“They Can't Take That Away From Me” Updated Arrangement -NEW! “Blues for Mr. T” -NEW! Misty - Simple Barre Chord Version -NEW! They Can't Take That Away From Me (Guided Arrangement) - NEW! Artistworks - Helping students develop to their fullest potential. The content of the Martin Taylor school is wonderful. After learning to navigate the site, I found an amazing amount of information and instruction for a wide range of ability levels. Just getting to watch a musician of that caliber play in such a relaxed and intimate situation is worth the cost of subscription. Highly recommended. As close to one to one tuition with musical legends that you can get. Artistworks is as close as you can get to personal tuition with musicians and other professionals at the very top of their game. I don’t know how some of the busy, concert class performers find the time to give such detailed and student specific video feedback. Personally, I have been thrilled to be able to have constructive tuition from Jazz guitar legend, Martín Taylor. Highly recommended. Outstanding program for artists of any skill level. I personally signed up with Martin Taylor and couldn't have had a better instructor for my style of guitar playing. Awesome! Don't miss out on learning from knowledgeable professional artists who know how to teach their craft. Gives one the opportunity to learn from the best musicians around. Having both subscribed to Bryan Sutton and Martin Taylor I couldn't recommend them enough . There's so much to take from the courses . I defy anyone not to improve . Àrtistworks.com is an excellent and affordable way to learn. Since I met this school i started a new road to expand music performance. I really recommend to be part of this courses. Loving fingerstyle guitar tuition with Martin Taylor! I find this method of learning fantastic. Having access to the online lessons, being able to interact with Martin via video and also having access to all the other students' interactions is very inspiring and informative. Being able to re-visit the lessons and video exchanges again and again means that I can gain more from all of the material as I progress down the musically path. This is something that has always been missing from the more traditional types of music lessons that I have experienced. Lastly, I find the cost of the subscription incredibly reasonable considering it's like having access to a never ending music lesson. It's still very early in my lessons, but I am finding it informative and enjoyable. I only wish I could find more time to practice! Could never have learned what I know without artist works and Martin Taylor.